BROOKLYN, NY, APRIL 1 (CNN) — At least eight people have been arrested in raids by a FBI-led Joint Terrorism Task Force in Crown Heights as part of an investigation into a Brooklyn-based Jewish militia group known as Jootaree. Federal agents made simultaneous arrests in Brooklyn and also at the terrorist group’s “Bar Schlemiel” training camp in the Poconos. 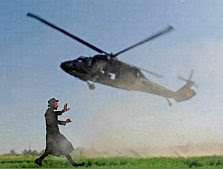 The smell of helicopter exhaust mixed with the scent of freshly-baked matzo in the Bar Schlemiel compound as the FBI choppers landed in the middle of the camp to make their arrests. The raid came so suddenly that the terrorists were caught by surprise, and surrendered without resistance. The suspects are expected to make an initial appearance in U.S. District Court in Manhattan on Monday. On Thursday, the FBI confirmed that federal law enforcement agents were conducting activities in several Brooklyn neighborhoods and the Poconos in connection to Jootaree, a Jewish militia group. FBI Special Agent Tammy McTavish told the CNN that the federal warrants in the case are under court seal and declined further comment. WABC-TV reports that helicopters were spotted in the sky for much of Wednesday night, and agents set up checkpoints throughout the area. Witnesses told the station that it was like a small army had descended on the area. The Department of Homeland Security and the Joint Terrorism Task Force are also involved in the raids. The FBI declined to comment on how extensive the Jootaree group is. “All I’m willing to say is that home-grown Jewish terrorism is a greater danger than most people think,” Torquemason said. “We’ve already locked up most of the Christian groups, so what other religious extremists are left? Snarkley Shivaree and Wangton Confabulation contributed to this report. Nice April Fools Day joke; yet, you forgot the part where during the raid, a Jewish militia member called a militia in New Jersey but was denied help: the contacted militia member was a Muslim working with Homeland Security investigating Jewish militias. Nice joke, I suppose, though when I started reading it I thought it was serious. What does that say about my view of the world and government at this point? Idk, but I wouldn't have been surprised to find out this was real, considering the history of the Jews. Nice to know Jihad Jane can get away with stuff, but Ben David can't. Also, not joking, can anyone tell me about a rumor I hear that the Hutaree Christian guys were actually planing on going after Muslim extreme/terrorists and not the police? I thought I spotted it on this site back when news first came out and no one knew what was happening. Any info would be helpful. I was already going to ask what was the terrorism thos Jews were being accused. But then I read the comments. Nice prank. Bombs R Us stores today started selling the halal version of Monopoly in which players use immigration to occupy streets. The buildings are already there and the object of the game is to bomb them. Then players use public funding and sharia finance to build mosques and cultural centers. Terrorist training camps in the Pocono's had me rolling. Not to mention the crack troops known as the Shecky Green brigade. Trained on the grounds of the Nevele resort. Their specialty is highly skilled interrogation techniques using the works of Jackie Mason to break the enemy down. If that doesn't work they merely bring in a bevy of Jewish mothers who make the prisoners feel so guilty they spill all they know. Oy vey! So, what's not to laugh? Damn, one more month you've earned my donation, this time with humor. You're breaking me -- literally. Both: yes, it's true, and yes, I will delete your comment. That was quick. I guess being a Jew Internet disinfo officer means a lot of work. Readers should note that I have apparently been officially converted to Judaism. Don't tell my wife! Due to the inability of some of our commenters to abide by the rules, I have had to close this thread to further comments. I regret the fact that this became necessary.